Almost everyone has a collection of some kind, whether it’s stamps or beer steins or Beanie Babies. Just the other day I looked in a drawer and realized that I have a collection of socks without mates. Not to brag, but some of them appear to date back to the 1970s. One of the virtues of sock collecting is that there is relatively little expense involved. That is in stark contrast to the hobby passionately pursued a century ago by a tycoon named Henry Clay Frick. His collection — named, for some reason, the Frick Collection — cost him millions of dollars. It is also probably the best privately-held collection of European art in the United States. Frick made a fortune in coal, steel and railroads in the late 1800s, and started acquiring paintings by the Old Masters: Rembrandt, Vermeer, Titian and Van Dyck. He purchased sculpture, procelains and furniture, too, to decorate the mansion he built on New York City’s 5th Avenue in 1913. In his will, Frick stipulated that upon his death the mansion and the art works it contained would become a gallery, open to the public. He did thoughtfully allow his widow to stay in the mansion after his death, which is why the Frick Collection didn’t open to the public until 1935; Mrs. Frick didn’t have to greet tourists while still in her bathrobe. Because it was originally a residence, the Frick Collection is not like most art museums. They tend to arrange the works by style, region and/or time period — here’s the hall of 17th century Italian artists, for instance, and that wing over there is Dutch genre painting. In the Frick, most of the art objects are where he put them when he lived there. He’s got an El Greco in the living room over the fireplace. On the wall next to that, where you or I would probably put our big-screen TV, is a portrait of Sir Thomas More by Hans Holbein. As often as I’ve visited the Frick Collection, I still marvel that Mr. Frick lived with these treasures all around him. And as much as I like the Frick Collection, I should mention that my taste in art doesn’t always mesh with Mr. Frick’s. He was so fond of rococo art that there is an entire room full of Fragonard paintings, and another of works by Boucher. I tend to speed walk through those rooms to avoid gagging. • St. Francis in the Desert, by Giovanni Bellini (1480), is a relative rarity in the collection, which is mostly portraits and landscapes. Frick apparently gave low priority to historical tableaux and religious paintings, but this is an important exception. 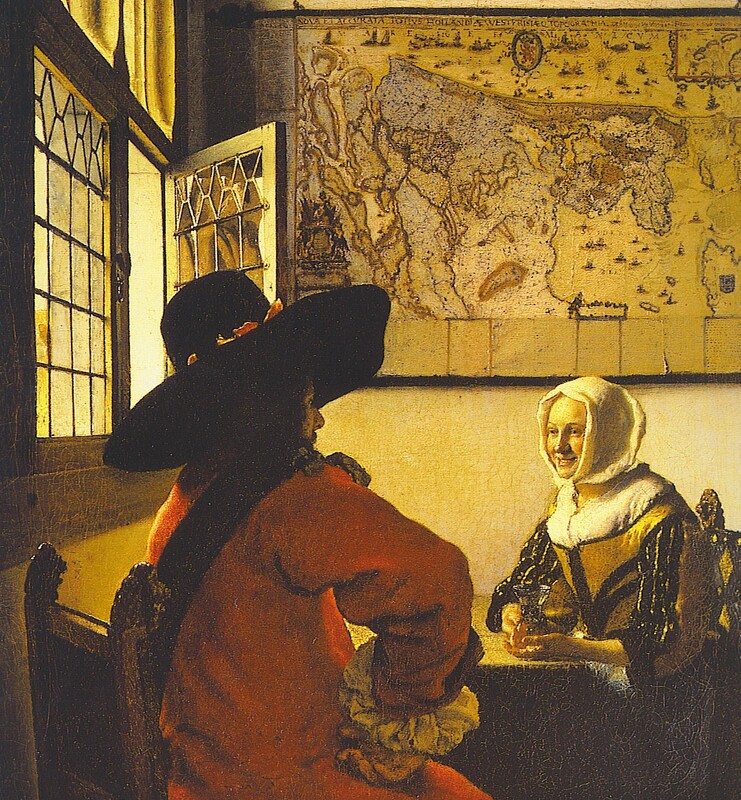 • Officer and Laughing Girl, by Johannes Vermeer (c. 1657), is one of three paintings by Vermeer in the Frick Collection. This is the one that always makes me smile back at the young woman in the picture (see above). • The Rehearsal, by Edgar Degas (1879), represents a venture by Frick into Impressionist art, which was sort of daring at the time. The young ballerinas are now a familiar subject, but I wonder if Mr. Frick may have been a bit out of his comfort zone when he purchased this. The Frick Collection is well worth a visit, and is open to the public Tuesday through Sunday. Regrettably, viewing of my sock collection is by appointment only. This entry was posted in Art and tagged Frick Collection. Bookmark the permalink. Thank you for sharing this on Bellini! Perhaps you might like some Bellini Art, please check out my blog at http://segmation.wordpress.com/2011/02/27/giovanni-bellini-italian-renaissance-artist-www-segmation-com/. Thanks for allowing this comment. The Frick Collection has no flatscreen TV? I, on the other hand, have a television that plays The Frick Collection on a continuous loop. And, with your permission, I’d love to add images of your sock collection. By the way, I’ve been looking for a single Nike running sock, circa 1986. Any chance you have one? Are you looking for the low-ride Dominator Mark VII sock, Dave? I have one from September of 1986. Sadly, it is not in mint condition — I don’t know who supplied Nike with their elastic back then, but frankly, it didn’t hold up very well. As for having the Frick Collection on a continuous loop… you can almost do that, because the Frick is one of the participants in the Google Art Project, which enables on-line “visits” to some of the world’s great art repositories.